Bendy chips to change tech forever? Could new circuit boards give rise to properly wearable electronics? 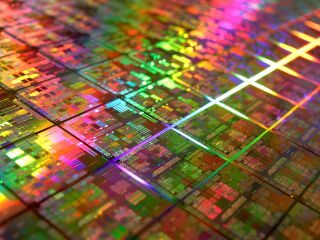 Could future PC processors also be made with bendy material? The microprocessor might be an amazing thing, but durable it most certainly isn't. So what if a next-generation processor could be bent or stretched into unusual shapes? It'd certainly change things a little, wouldn't it? "The notion that silicon cannot be used in such applications because it is intrinsically brittle and rigid has been tossed out the window," said John Rogers, professor of Material Science and Engineering at the University. The findings, published in the US journal Science, revealed how the researchers have been able to create circuits with transistors and other elements from so-called nanoribbons of silicon crystals combined with plastic. The circuits are then backed with silicon rubber to make them malleable. If stacked on top of one another, 10 of the 'boards' would be as thick as a human hair, say the researchers. "We're opening an [opportunity] for electronics and optoelectronics that goes well beyond what planar configurations on semiconductor wafers can offer," added Rogers. The material used may be malleable, but the scientists say the deal breaker is that there is no loss in electrical conductivity. The research adds to the previous work carried out in 2005 by Professor Rogers and his team - they developed stretchable circuitry, but the pull could only be mono-directional.